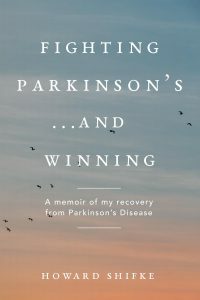 We have discussed many times over the years that the Parkinson’s Recipe for Recovery® approach to Parkinson’s recovery is that the recovery comes from deep inside. In the past, I have presented it as if you are chipping away from the inside of an iceberg, day by day, slowly but surely making progress, even if everything on the surface looks pretty much the same. Today, we will explore what this recovery means when I say it truly is a recovery from the inside out. First, let’s look at conventional Western medicine. They say there is no recovery. Their approach is to focus on the outside only, disease “management” while you deteriorate. Help you move better while you deteriorate. Help you look better while you deteriorate. Their prognosis, you have no choice except to deteriorate, so why not move a little better and look a little better to the others while you “progressively degenerate.” The deterioration and progressive degeneration are on the inside, and Western medicine Parkinson’s treatment does not look beyond the symptoms. It is the inside deteriorating that makes your outside symptoms deteriorate. If you look at the side effects of their medications, beyond the ones that look like Parkinson’s symptoms, the other side effects negatively impact your organs and your mind (the inside deterioration). Make no mistake, there is no recovery in the Western medicine view of Parkinson’s. Now, let’s talk about the Parkinson’s Recipe for Recovery® approach. Recovery is in the prognosis. The Recipe looks deep inside and focuses on healing the body from the inside out. This means that as you heal your organs, clean toxins from your system, calm your mind, and open your heart (healing the body on the inside), the end result is the symptoms go away (proof of the recovery on the outside). Look at your body as a survival organism. What is on the inside? Your organs. What is on the outside? Your limbs and how you look when you move. As a survival organism, the body will prioritize energy for your organs ahead of your limbs and how you look when you move. Why? Survival! If your heart fails, you become ill and may die. If your lungs fail, you become ill and may die. If your kidneys fail, you become ill and may die. If your liver fails, you become ill and may die. If your large intestine fails, you become ill and may die. If your bladder fails, you become ill and may die. If you cannot swing golf clubs, you do not become ill or die. If you do not walk well, you do not become ill or die. If you do not dance on Saturday night, you do not become ill or die. If you do not ride a bike 20 miles, you do not become ill or die. (Yes, you may be upset by the inability to do these things, but for a survival organism focused on health, these are of little concern when compared to your organs functioning correctly). The Recipe is designed to heal your organs. In a Parkinson’s body low on energy, it takes a lot of energy to heal your organs. Once your organs start healing, you may see some relief of symptoms. However, as the organs are healing and begin moving more toxins into your system for removal, the removal process takes a huge amount of energy, which leads to your symptoms “looking worse and feeling worse” for a period of time. If your body is using the majority of your energy for survival and healing, then there is little energy to hold your symptoms in check. Do not be afraid of the symptoms as you ARE NOT getting worse. Instead, be excited for the healing as you ARE getting better. Please remember, as you are getting better, there will be times when you will look and feel worse. Click here for an in-depth discussion of why this occurs and why you need not be afraid. It is all about energy…and SURVIVAL! Your body wants to get healthy and your body wants to live. Ten times out of ten, it will prioritize energy like this: Inside first (organs), outside second (limbs and how you look when moving). It is a rather simple formula. This is why when you are doing the Recipe, you ALWAYS are getting better. Why? Your body is using the majority of your energy to heal you from the inside out. As you heal your organs, it takes less energy to make them function. This results in more energy for your limbs and how you look when you move. When your organs are completely healed, and your mind is calm with acceptance and surrender, and your heart is filled with joy and compassion, and gratitude, you have brought yourself back into balance. And the Parkinson’s, which is a symptom of your life out of balance, goes away. Click here to read more about bringing your life back into balance. Now you can fully understand what I mean when I say that Parkinson’s is curable from the inside out. It all begins from deep inside, healing the organs, and then it moves up to the surface, healing your limbs and how you look when you move. Your cure is a result of the combination of faith, attitude, action, and then progress. Click here for a reminder of how this recovery proceeds forward by chipping away, day by day. Western Medicine: Parkinson’s is incurable. You cannot improve or be cured. Parkinson’s Recipe for Recovery®: Parkinson’s is IN CURABLE!!! You can improve and you can be cured…from the inside out. Really useful explanation Howard. It helps to bring recovery to life and makes sense of what’s happening when we’re doing the recipe. I love it! Thank you so much for your constant support. You really make a difference. Thanx, Howard! A great reminder Well put, easy to understand, encouraging! Thank you dear Howard…I’m so glad I found you and, with that connection, my road map for healing…your generosity in sharing your knowledge and heart is a godsend (I don’t think I’m too far off with that analogy). Your support as a coach, a mentor and a friend is beyond phenomenal. Thank you, Howard, for this reminder. Brilliant, limpid, inspiring. Feel so very grateful for these ever-apposite posts that give wings to healing (just when one was feel a bit limp) and lift the heart back to warrior mode. Oh! Feel so very deeply blessed to have the extraordinary good fortune to receive your profoundly game-changing wisdom. Dear, wonderful Howard, you’ve done it again. This message is so reassuring! When I feel worse, I am getting better. The toxins are being stirred up and released. I can accept and even be grateful for the pain, and that makes way for the dopamine to flow. My faith in the cure and my trust in God are soaring! I am going back through the archives and reading the great encouragement that is stored in them that I missed before I found your blog. Thanks from the bottom of my heart!!! Hi Howard, fabulous post. Just when I think you can’t explain it all any better, you go and pull something new out of the bag. Inspiration my friend, as always, God in motion. Big Love to all my fellow warriors. Perfect timing for me Howard! Bless your heart, I think in some way you can hear me thinking!! Thank you. It all makes so much sense Howard, the way you explain it! We are all so blessed to have found you! Thank you for helping us stay on track, with your constant support and encouragement ! How can we not win the war. We are all equipped with the armor needed to win the fight. Slow and steady wins the race! With much love and gratitude for all you do. Couldn’t have put it better myself Melanie! My thoughts exactly. Thank you Howard I’ve been doing the exercises faithfully now for the last month and my symptoms were getting worse and I had remembered you writing one time about cleaning the pool and scraping the algae from the sides your blog came at just the right time for me there’s no such thing as coincidences! Howard- Wow! What insight and encouragement! It really put things in perspective for me ! You are a blessing, blessing, blessing !!!!! I just put that book at the top of my reading list. Looks very compelling! Thanks, Cynthia and Margee, for the recommendation.